If you're looking to add a little pizazz to your business or contact cards, you'll want to check out this amazing DIY for adding your own gilded edges! Crane & Co. intrigues its fans once again with a short video on the creation of a letterpress wedding invitation. It's amazing to see the time and detail put in to every piece. If you've ordered letterpress stationery in the past, or plan on ordering it in the future, be sure to check out this great video! Take a few minutes this weekend to wrap up your holiday thank you notes, or compose a darling love letter to your sweetheart for Valentine's Day (or just because you love them!) We've got tips for Writing a Gracious Thank You Note and Writing a Love Letter from the Heart. Writing a note is so much more fun with a unique writing instrument. These streamer-wrapped pencils, spotted by Hank & Hunt, are great for kids, teens, and grown-ups! The Fine Pin of the week is a sweet one... check out these lovely lace crepes! 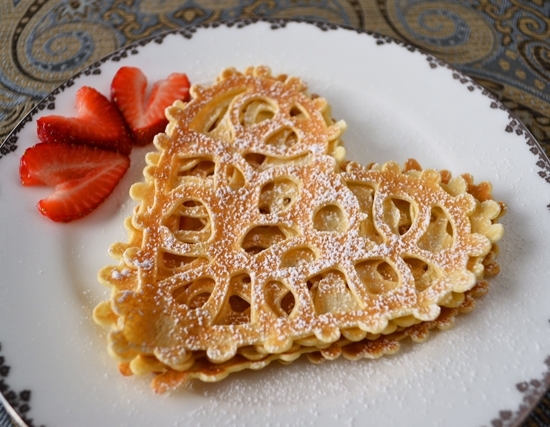 Wouldn't they be perfect for a Valentine's Day breakfast treat? Visit our Valentine's Day Pinterest board for more inspiration!